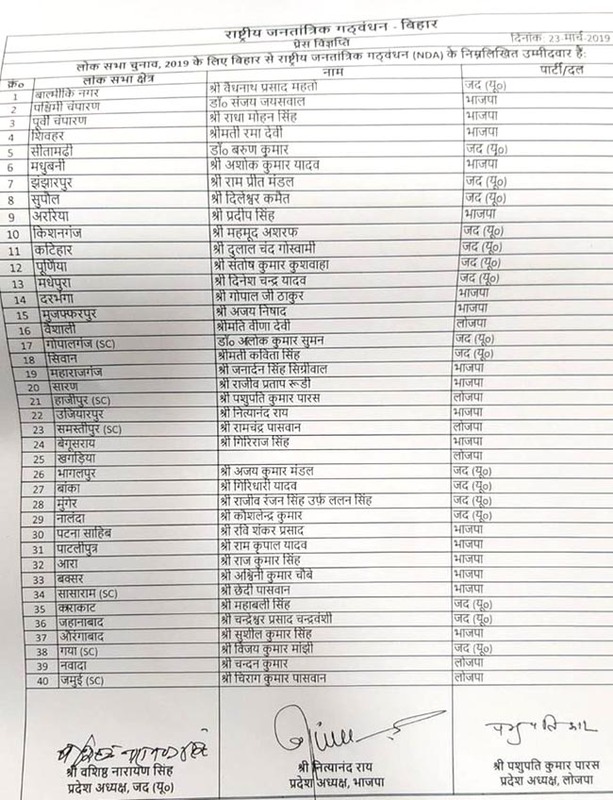 Patna, March 23 (IANS) Bihar's ruling NDA on Saturday announced candidates for 39 out of the total 40 Lok Sabha seats in the state. LJP chief Ram Vilas Paswan will not contest from Hajipur seat, the party has fielded Paswan's younger brother Pasupati Kumar Paras, a Bihar Minister and state LJP president, in his place. "All the Union Ministers from BJP including Radha Mohan Singh from Motihari, Ram Kirpal Yadav from Patliputra, Ashwani Choubey from Buxar, R.K. Singh from Ara, were given tickets," Yadav said.